We are delighted! 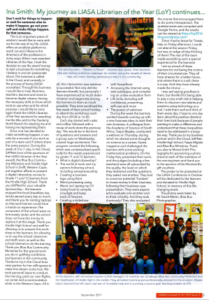 In the Cloud published an article in LIASA-in-Touch, the publication of the Library and Information Association of South Africa (LIASA)! Read more about the Journey of a LIASA Librarian of the Year, by clicking on the image below.